At Indiana University, burly Ted Kluszewski concentrated on football, where he achieved Big Ten honors as an end. But he turned his attention to baseball in 1946 when he signed with Cincinnati. Two years later, he began a 14-year major league career at Cincinnati, Pittsburgh, Chicago White Sox and Los Angeles Angels. He enjoyed his greatest success in his 10 seasons with the Reds, so much so that he was voted first baseman on the “Greatest Reds Team Ever” by sports fans in Cincinnati. He hit .300 or better seven years in a row, had five seasons of 100 RBI or more, and in 1954 led the NL with 49 homers and 141 RBIs. Traded to the White Sox in 1959, he helped the team to the World Series, where he established a Series record for a six-game set of 10 RBIs (he hit three homers and batted .391). Ted Kluszewski and his bulging biceps became a success in professional baseball, despite a late interest in the sport. Burly Ted concentrated on football, enjoying four great seasons in the Big Ten as an All-League end at the University of Indiana. In the summer, Kluszewski kept in shape by playing softball and impressed opponents and spectators alike with many tape measure home runs. Despite his success in football, Ted signed with the Cincinnati baseball team in 1946 and displayed his ability to hit the ball in his initial season. He led the Sally League with a .352 batting average at Columbia, South Carolina, driving in 87 runs in 90 games. 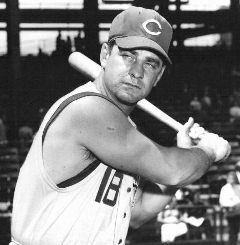 This performance earned Ted a promotion to the Southern Association that produced another batting title (.377, 68 RBIs) and a late season chance in the majors with the Reds. While possessing great physical strength, Kluszewski was also a great student of the game who looked for ways to improve the finer skills of hitting. He spent many hours of studying film of him taken while batting to look for areas of improvement. During his time with the Reds (1948-1957) Big Klu batted over .300 seven times and drove in 100 or more RBIs in five different seasons. He also developed a potent home run swing as well. 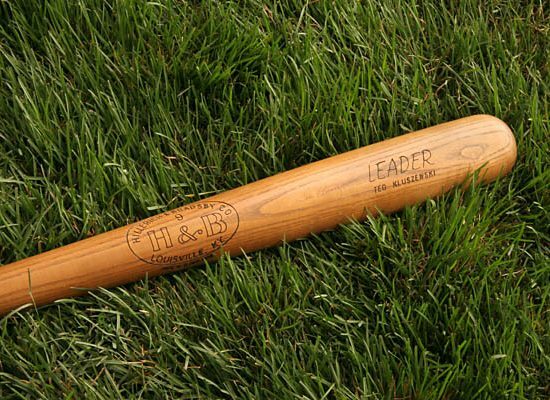 The left-hand hitting slugger slammed 25 home runs in 1950, 49 in 1954 to lead the National League, and another 47 homers in 1955. In 1956, he hit 35 homers but suffered from a slipped disc that was to cut into his home run production during the rest of his career. 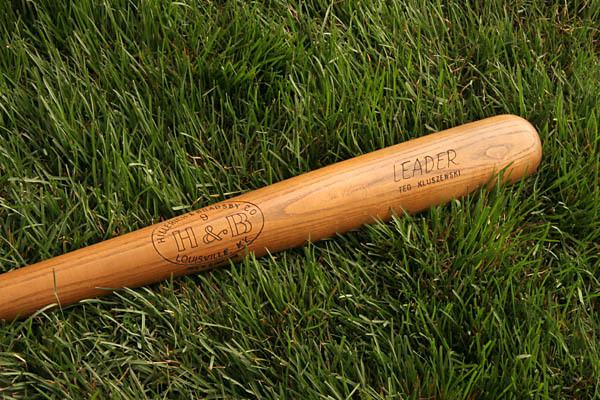 His 141 runs batted in during the 1954 season was tops in the National League. He also led NL first basemen in fielding average five consecutive seasons (1951-55). After the 1957 season, he was traded to the Pirates and eventually ended up with the Chicago White Sox. He helped the Sox win the pennant in 1959, hitting .297 in 31 games. Kluszewski was a star in his only World Series appearance. He drove in 10 runs, establishing a World Series record for a six-game series, slammed three home runs and batted .391. Despite his heroics, the White Sox lost to the Los Angeles Dodgers. After playing with Chicago in 1960, Ted was selected by the Los Angeles Angels in the American League expansion draft. After the 1961 season, he retired. He batted .500 (7 for 14) in four All-Star game appearances (1953-56).